Easter Day (April 16th, 2017) – Rev. Canon Dr. William J. Danaher Jr.
One of my favorite things to do and ways in which I feel like I’m being up to date as a priest is I spend a little time each morning reviewing Facebook. For me, Facebook is not just an opportunity to visit friends that I’ve had in the past and examine just how much more successful they are than I am. Facebook is a time for me to check in on a lot of people that I only see every now and then in church who are traveling or doing other things. This is a way to stay in touch, and occasionally you see things on Facebook that bring you back. You have a tradition on Facebook of doing throwback Thursday which is a thing where you pull up one of your pictures from when you were younger and you put it up on there for all your friends to see just how well you’ve aged or maybe not so well. In any event, last week, I was looking on Facebook and a parishioner from Christ Church Cranbrook was at the National Cathedral and he found this incredible panel painting by Benvenuto di Giovanni which was done in 1490. It is these five panels of Christ’s passion, death, and resurrection. He posted it on Facebook. It was a wonderful thing. As soon as I saw it, I was taken back because in my own life, when I was in seminary, I used to go to the National Gallery of Art and I would examine all of the paintings there, and for reasons that I found puzzling, I found this painting to be incredibly powerful. It was the painting that probably made the most impact on me when I was 24 years old. It made such an impact on me that I took to going to see it about every other week. On a Friday, I would leave school and go down on the train to see it. I had a mentor who was a professor of mine, who was kind of a hero of mine. His name was Walter Eversley. He had a PhD from Harvard and a JD from Columbia, and yet spent his entire career building churches. He was an African American priest. For reasons that are odd, he took me under his wings and shepherded me through seminary. One Friday afternoon, because he was perhaps getting a little suspicious because I was leaving, he decided to come with me to the National Gallery. And we went to that painting and we stood before it, and I was explaining to him why I found it so powerful. Because what struck me so was the fact that I discovered in the art of the Renaissance, a kind of archive of the Christian story. I found an archive that I could revisit and see, and I could see a kind of realism in it. Not the fact that everything that was depicted there was as it actually happened, but rather, I saw the effort of the artist to depict a realistic and truthful understanding of what happened when Jesus died and rose again. By truthful I mean full of truth. Full of life. If you look at the panels that I’ve given you today, you can see why he asks this question. Because on the panels in which you have two of them, you have Jesus carrying the cross and he’s looking kind of older and as if he’s being worn down by the sufferings of this life. Then you see this transitional panel where Jesus is harrowing the gates of hell. He’s harrowing hell for all the people who had been locked in limbo before his resurrection, so you have this magnificent panel where Jesus has slammed down the gates of hell right on top of the devil, which is the little red creature that’s being crushed below, a little bit like the wicked witch in the – whatever that movie is! Then you have the picture of Jesus rising from the dead and the stone that is in front of the tomb is kind of flying out towards the viewer. Note that the Jesus of the resurrection is a little blonder. He’s a little younger. He looks different than the Jesus before who is dying on the cross. I suddenly was aware of that incredible privilege of him pouring himself into me but also the incredible privilege of having watched people of a different race and ethnicity engage in that piece of art. Since the time of that encounter, I’ve learned a lot about the history of art and about the Renaissance. We can all explain the history of Renaissance art in terms of big powerful movements of commerce and engines of warfare and city states that were in competition with one another, and the Black Plague which had killed a third of Europe’s population, which meant that people began to elevate and look towards a human figure to find some kind of imprint of God. But the answer that my professor gave is truer to the theology of this panel: The body is risen and glorified. That acclamation, that truth, that witness, was more powerful than even the painting itself. In fact, I suddenly became aware of the fact that that painting, as beautiful as it was with all of the realism that di Giovanni was trying to paint into it, that the truth of the resurrection lay even beyond the grasp of the artist. That the truth of the resurrection, the power of Jesus, of life over death, all of that was just beyond the images that you could see. Of course, this goes with the grain of that whole movement known as the Renaissance because, you see, part of the reason that all of the intellectuals and artists of that time period looked to human figures as they were trying to rediscover the truth of God that was just beyond their understanding. Renaissance can be translated as “rebirth”, but renaissance also means “resurrection”. What does it mean for you to follow a god in which the body of Jesus is risen and glorified? For Benvenuto di Giovanni, that meant trying to render with his own categories of goodness, truth, and beauty, the fullness of what he believed Jesus meant. The power of the resurrection. The stone flying out to the viewer so that they would know that death and sin and disease would not constrain them. 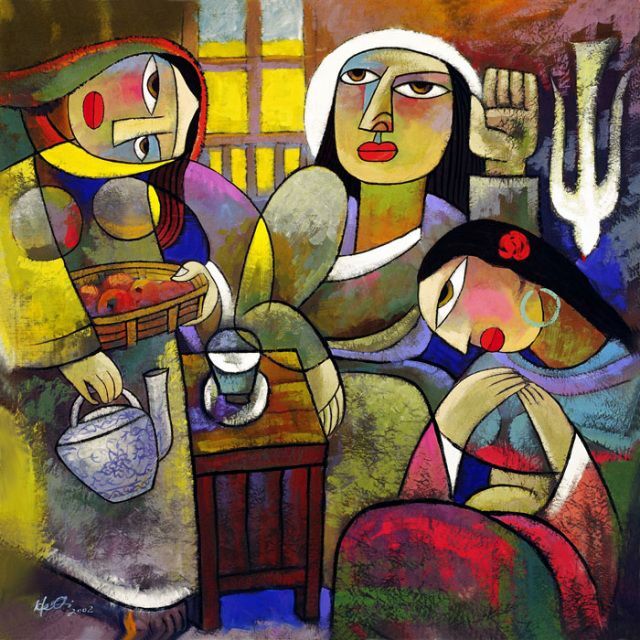 On your bulletins today, there’s another image painted by He Qi, a Chinese artist. For him, using his own standards of goodness, truth and beauty, he generates his own vision of the resurrection. There you see the women awaking to discover an angel which looks remarkably like the artist himself holding not a staff, which was the customary thing to hold in the renaissance for Jesus and other angelic beings, but instead a lotus, which is a symbol of peace. What does it mean for you and I to proclaim and bear witness to the fact that the body of Jesus is risen and glorified? I think it means looking at our own world, at our own standards of goodness, truth, and beauty and looking for the ways in which Christ is yet again resurrected in our midst. It means looking and seeing how the risen Christ, who is as real as this pulpit, becomes real in our lives. It means being changed and turning away from the power of sin and death and towards the reconciling love of Jesus, the power of life – the power to live as if death were not the power to no longer be trapped by our fears and frustrations. I think anytime you see anyone imagining in their minds what life might be were it not for the power of sin and death, that is a moment in which you begin to bear witness to the resurrection. Of course, that was a young girl’s desire to reclaim a kind of dignity. As much as that might seem to be a little bit shallow to you and me today, particularly if you are no longer in the high heel business, think about for a moment what it means to want that dignity. Think about what it means for us to live into that dignity. Think about what it might mean to us to create a world built by faith and love and hope in which that dignity is upheld. That is what I think it means to proclaim and bear witness to the body that is risen and glorified. All of our readings today provide a window into this, but we see it most in the gospel of John. Part of the challenge in reading the gospel accounts of Jesus’ resurrection is that you can see in the text itself a kind of crater forming around this incredible event that has taken place, so the gospel accounts are all increasingly particular. They all focus on specific things that happened. In today’s gospel, you read about bending and looking into the tomb and what they discovered. Yet, there’s always some kind of seam, some kind of crater in the words themselves. When you look at them all together, it’s sometimes hard to know exactly what is being communicated, because in some instances Jesus is raised in Jerusalem. In others, he comes in Galilee. In still others, he does not ascend until 40 days after he has been on the earth, so we read in Acts. In John, all of these things happen at the same time. Jesus is raised. He is encountered in the face of a gardener. He tells Mary after this incredibly intimate meeting, “Touch me not because I have not yet ascended to the father.” All of the things, all of those different scenes from his resurrected life, are compressed into this one piece of scripture. The point that’s being made to us through this is not that we can somehow bring everything back into a neat and tidy sequence with a beginning, middle, and end, you see. The point that’s being communicated to us in today’s gospel is that eternity is beginning with Jesus Christ. The resurrection is not something you hope for at the end of your life. The resurrection begins now when Jesus Christ becomes Lord of your life, when the light of Christ shines from you, when the spirit of Christ dwells within you. The resurrection begins now, so we meet Him in the face of strangers and gardeners and people who greet us. We meet Him in the people with whom we build our lives around. We meet Him in our church and in our society. That is what it means as we read today in our epistle to bear witness to the resurrection. That is what it means to set our minds on higher things. Because God has come into our midst to give us the power to live as if death were not and to be no longer imprisoned by our sins but to be liberated. The text of today’s gospel is like a painting. It’s revealing a reality that lies outside of it that is beaming in through it, and the question is, if you were an artist, what would you paint? Amen.